Davor Šuker, Zvonimir Boban and Slaven Bilić in 1998, and now Luka Modrić, Ivan Rakitić and Dejan Lovren in 2018. 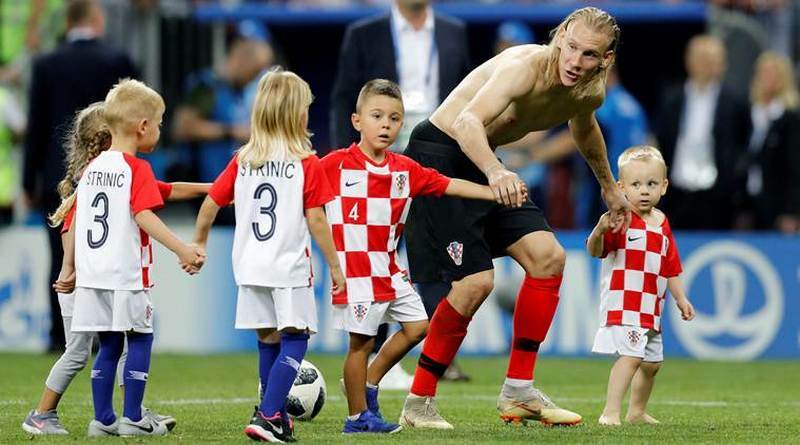 Domagoj Vida with his kids and the kids of Ivan Perišić, immediately after the match with England. Photo by Reuters. No doubt, the greatest success achieved by Croatian soccer is the third place at 1998 World Championship (Coup du Monde)held in France. The excellent team of Holland was defeated by 2:1 in the match in Paris. 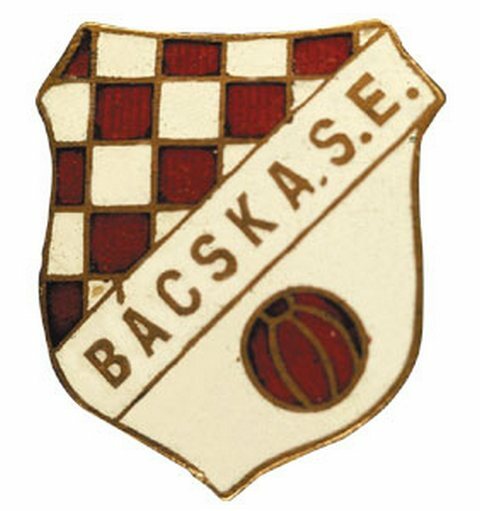 Thus Croatian team became the greatest surprise of the Championship. Our national team has been led by Miroslav Ciro Blazevic (Bosnian Croat born in the town of Travnik). It is well known that skiing is the sport of the rich. 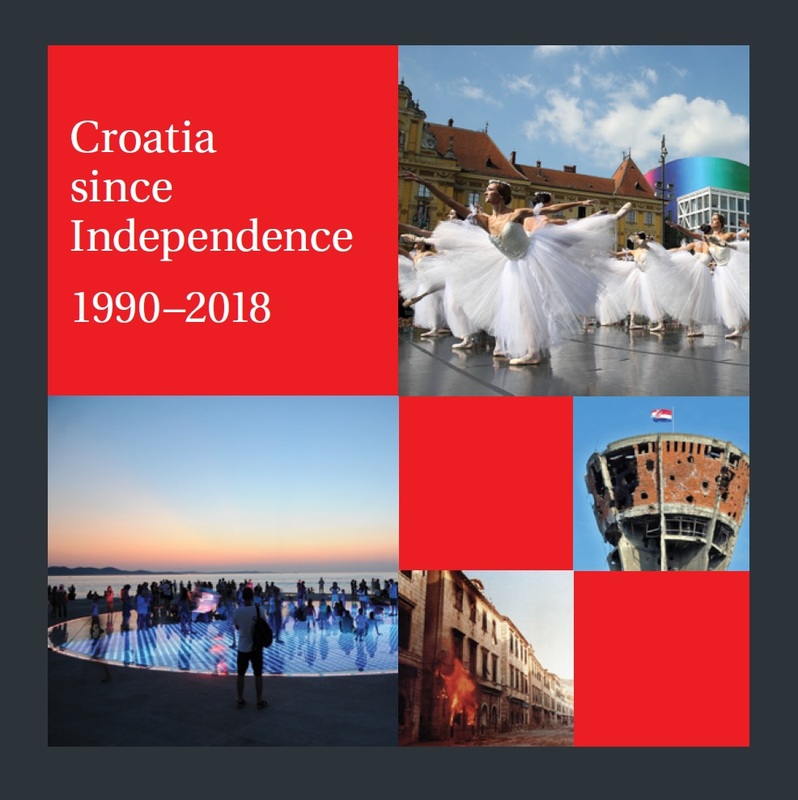 When Kostelic's went back home from Austria, Germany, France or Switzerland, several times it happened to them that they had to sell their skies in order to be able to buy petrol for their Lada... And let us not forget, at that time theĂ Greater Serbian aggression was raging throughout Croatia and Bosnia-Herzegovina (1990-1995). 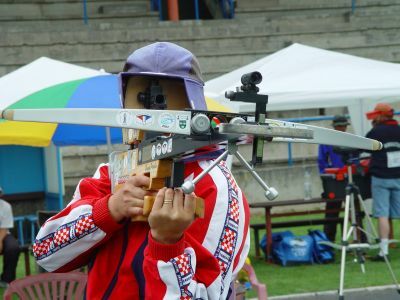 Mr. Ante Kostelic-Gips himself, father of Ivica and Janica, is an amazing Croatian sportsman and trainer, former handball player, working with his children on the long run. He remembers with deep gratitude an Austrian, Mr Willie Arnsteiner, wire-keeper, who donated them 100 Schillings daily during a critical period, and who predicted their great skiing future. 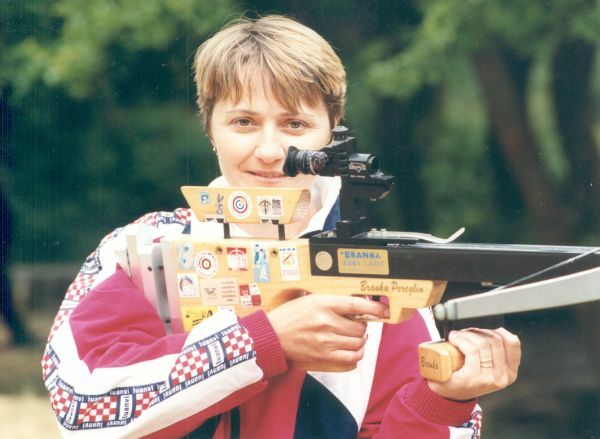 At the age of 15 Janica had 22 consecutive winsĂ at European competitions for children during one season. 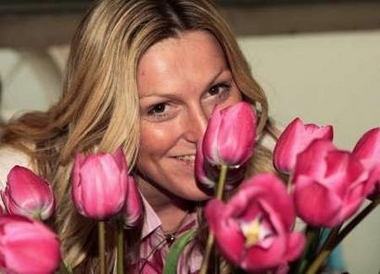 One day after the death of president Franjo Tudjman, Janica was skiing with mourning black armband. Young Kostelic's were raised in deep patriotism, and their sacrifices will always be remembered. Let us also mention a regular short ritual of Christian crossing immediately before every competition. It is amusing to see how "objective" European TV media strive to avoid this indicative and important detail. 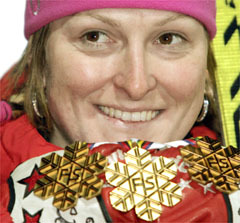 AcadĂŠmie des sports, Paris - Le palmars 2005 ... Janica Kostelic recoit le Prix International Monique Berlioux 2006(performance la plus remarquable de l'annee ecoulee): Janica Kostelic (Croatie - Ski alpin), triple championne du monde de ski alpin. Table of the Croatian Glagolitic Script written by Juraj Slovinac (Jurja iz Slavonije, George d'Esclavonie) handwritten by the end of 1390s in Paris, at the famous University of Sorbonne. Juraj writes Istud alphabetum est chrawaticum (This is Croatian Alphabet! ), see boxed at the bottom of the table. The number above Jus is 5000, not 4000, since 5 at that time was written similarly as we write 4 today (information by the courtesy of Darijo Tikulin, Zadar). 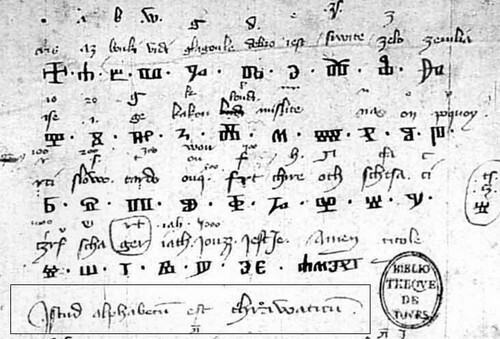 A table of Croatian Glagolitic Script according to Georges d'Escalvonie (arround 1400), and with letters created according to the first Croatian printed book from 1483. 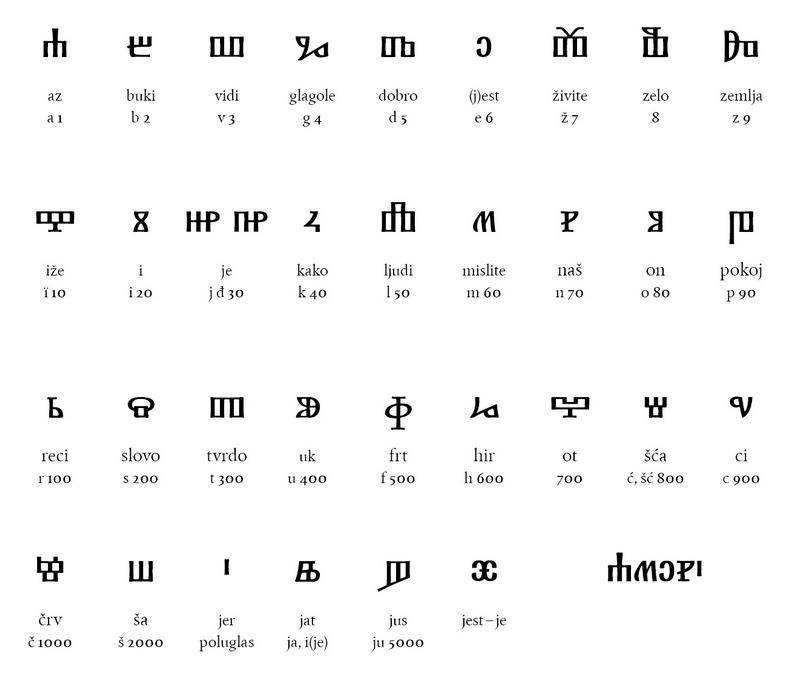 The Croatian Glagolitic font has been created by Filip Cvitić. 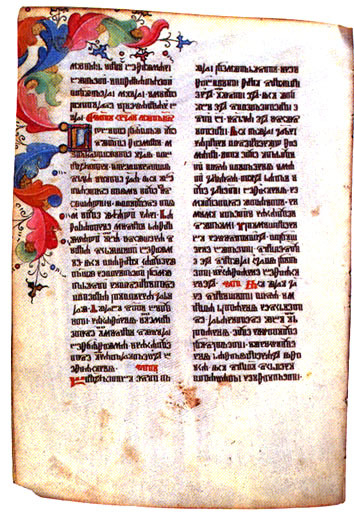 Let us mention the name of Dobric Dobricevic (Boninus de Boninis de Ragusia), Ragusan born on the island of Lastovo, 1454-1528, who worked as a typographer in Venice, Verona, Brescia. His last years he spent as the dean of the Cathedral church in Treviso. His bilingual (Latin - Italian) editions of "Aesopus moralisatus, Dante's "Cantica" and "Commedia del Divino" were printed first in Brescia in 1487, and then also in Lyon, France. We know of about 50 of his editions, the greatest number belonging to the period of 1483-1491 that he spent in Brescia - about 40. 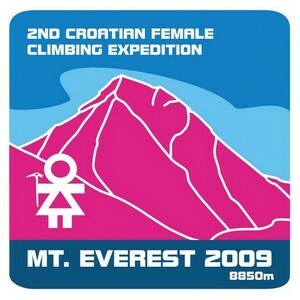 Croatia is in possession of 19 of his editions in 30 copies. The greatest number of his editions is in possession of the British Museum, London (22). Another Croat, known as Jacques Moderne, born in Buzet (15th century), Istria, printed about 50 music booklets in Lyon, France. It is interesting that a table of the Glagolitic Script was included as early as in 1664 in a book prepared by Richard Daniel and published in London. It represents a catalogue of various Scripts in use in the Christian world. The Glagolitic Script presented there is called expressly the Croatian hand or Alphabetum Charvaticum. 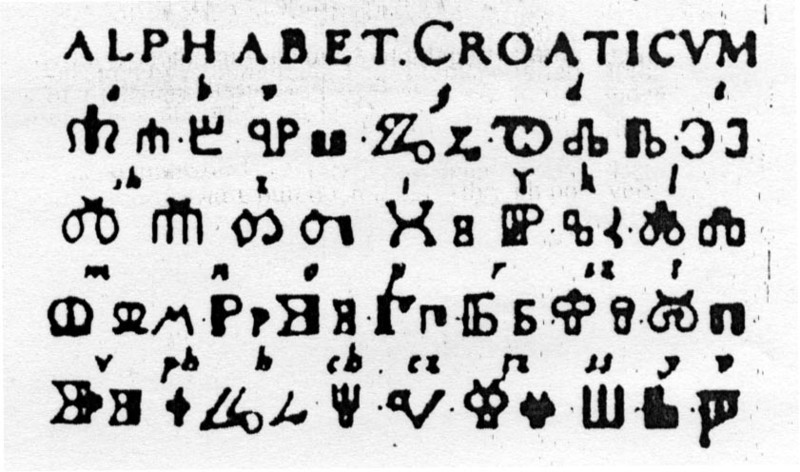 The book contains also the table of Croatian glagolitic quick-script, which Daniel calls Sclavorum Alphabetum, and Croatian - Bosnian cyrillic (many thanks to Professor Ralph Cleminson for this information). 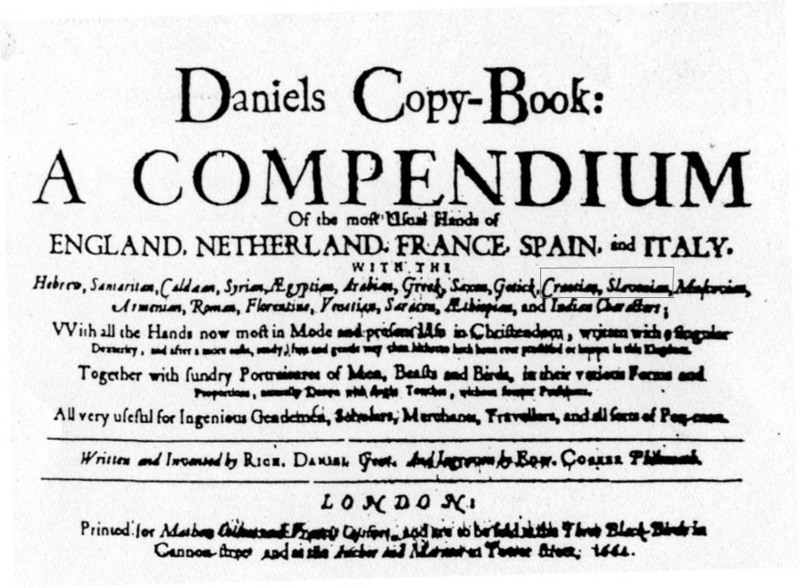 The book is entitled Daniels Copy-Book: or, a Compendium of the most usual hands of England, Netherland, France, Spain and Italy, Hebrew, Samaritan, Caldean Syrian, Aegypitan, Arabian, Greek, Saxon, Gotik, Croatian, Slavonian, Muscovian, Armenian, Roman, Florentine, Venentian, Saracen Saracen, Aethiopian, and Indian characters; with all the hands now most in mode and present use in Christiendom... See [Franolic] and also [Kempgen]. Citizens of Paris can see several Croatian Glagolitic collections in Bibliotheque Nationale. Two exceptionally important Glagolitic codices are held there: Code Slave 11 (14th century) containing the oldest known collection of Croatian religious lyrics, and Liber horarum (1317). Simun Kozicic Benja, the Krbava-Modrus bishop, founded his glagolitic printing house in the town of Rijeka in 1530. One of 6 published books was Knizice krsta, printed in 1531. Only three copies exist today: in Paris (Bibliotheque Nationale, sign. 49.052), in Sankt Petersburg (The State Library, sign. No 3093), and in Vicenza (Biblioteca Bertoliana) in Italy. 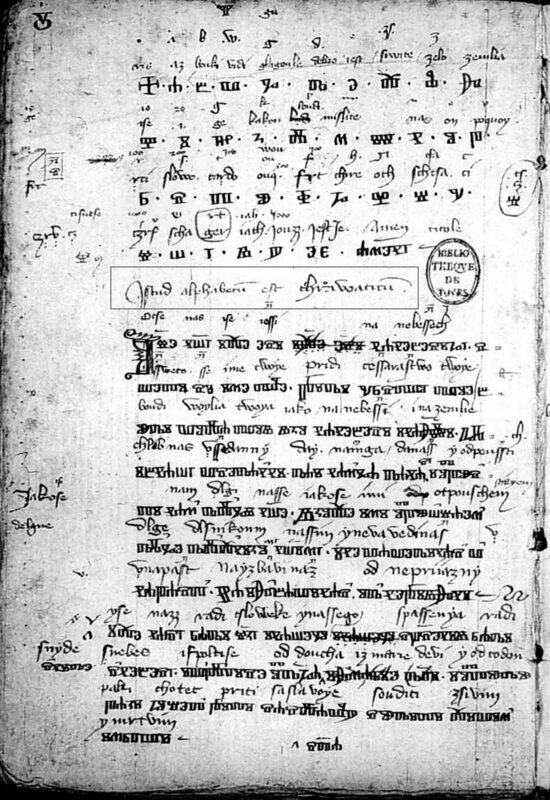 The only copy of the earliest printed book in the Croatian Cyrillic (1512, prepared by Franjo Ratkovic from Dubrovnik) is also held in Bibliotheque Nationale. The first known opera in Croatia was performed in Dubrovnik in 1629, composed by Lambert Courtoys junior. His grandfather was a naturalized citizen of Dubrovnik, Lambert Courtoys senior from France. The opera was composed on the text Junije PalmotiĂŚ's (1606-1657) text Atalanta written in Croatian, which bore the subtitle Musica. Unfortunately, the scores are not preserved, but a document preserved in the Dubrovnik archives from that time proves that it was indeed an opera performed by 17 musicians. See [Demovic, Rasprave i prilozi, p 387]. 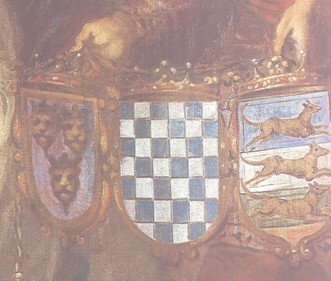 Dubrovnik had consulates from Lisabon to Odessa on the Black Sea. In the 18th century Dubrovnik had as many as 80 consulates, which is more than Austria at that time (35), or France (40). From an interview with dr. Ilija Mitic published in Sonja Seferovic: Znanstveni rad koji je urodio dugogodisnjom suradnjom s njemackim sveucilistima, Dubrovacki vijesnik, 24. veljace 2007., p. 51. It seems that Dubrovnik was in possession of Archimedes' telescope, about which a testimony exists written in 1672 by Antun Sorgo (Sorkocevic, son of distinguished Dubrovnik composer Luka Sorkocevic), in his book "Origine et chute de l'ancienne Republique de Raguse". Antun Sorgo was the last ambassador of the Dubrovnik Republic to France, where he spent 35 years. The Archimedes' telescope seems to have been lost during the desastrous Dubrovnik earthquake in 1667. The basic idea of Archimedes' reflecting telescope (3rd ct. BC) seems to coincide with that of Newton's reflecting telescope (Isaac Newton, 1642-1727). 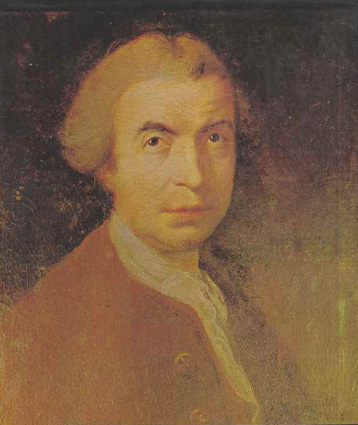 The greatest and most famous Croatian philosopher and scientist Rudjer Boskovic (Boscovich, 1711-1787), was born in Dubrovnik, where he was educated in the Jesuit Collegium. He was a member of the Royal Society of London, a member of St.Petersbug Academy, "membre correspondant" of the French Academie Royale des Sciences, a member of the Accademia dell'Arcadia, a professor at many European universities. Very delicate work on repairing the cupola of St. Peter's church in the Vatican (diameter: 42m) was entrusted to R. Boskovic, a proof that he was a leading European authority for static computations and civil engineering of that time. Upon the request of Austrian Empress Maria Theresia, Boskovic was solving the problem of stability of Royal Library (now National Library) in Vienna. Portrait of Boskovic by the English painter Edge Pine (London, 1760). He was also the founder of the astronomical observatory in Brera near Milan. In 1773 a charter granted by Louis XV made him a French subject. Soon he was appointed by Louis XV to a very prestigious position and became the Director of Naval Optics of the French Navy in Paris (Optique Militaire de la Marine Royale de France). He left to his adoptive country an achromatic telescope and micrometer. Boskovic spent nine years in France, and became a good friend to many outstanding scientist, like the mathematician Clairaut, Lalande, Buffon. When D'Alembert took him for Italian, he hastened to correct him. Boskovic stayed 7 months in England and met many famous scientists there: James Bradley (famous astronomer), George Parker (president of the Royal Academy), Samuel Johnson (Lexicographer), Edmund Burke (philosopher and political writer), Joshua Reynolds (the first president of the Royal Academy of Arts), and others. It is interesting that in England he designed a telescope filled with water in all its components, which was implemented at the Greenwich observatory in 1871, that is, 84 years after his death. He also met Benjmanin Franklin, who showed him some of his electrical experiments, see an article by Branko Franolic. Boskovic was also a brilliant Croatian Latinist poet. He wrote an extensive scientific epic De solis et lunae defectibus (On Solar and Lunar Eclipse) published in London in 1760. It contains 5570 Latin verses, and was dedicated to the Royal Society of England whose member he was. In the title one can read "Father r. Boskovic, of the Jesuit Order", although at that time it was forbidden for Jesuits to live and work in England. The epic was written in the manner of Roman classics, in dactilus hexameter. When Charles Burney, a well known English musicologist, met Boskovic in Milan, he wrote: ...if all Jesuits were like this father, who uses the higher science and the work of mind to advance science for the happiness of mankind, then it were to be wished that this society were as durable as is this world. Boskovic was buried in the church of S. Maria Podone in Milano. 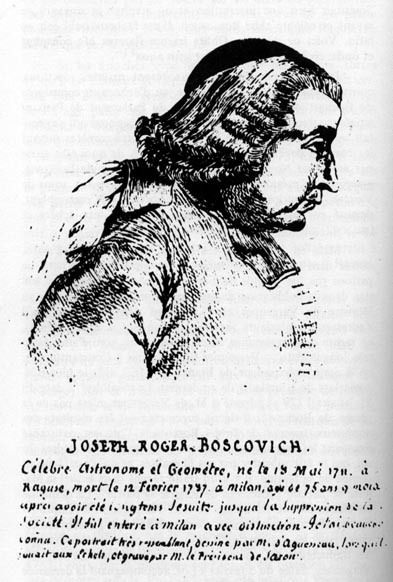 Le plus grand mathematicen que l'aie connu a Rome est M. Boscovich, alors jesuite: il est ne a Raguse en 1711, mais il vint a Rome etant encore fort jeune, et apres avoir longtemps professe les mathematiques au college romain il fut fait professeur a Milan et ensuite a Pavie; mais l'on voyait avec peine des talents superieurs comme les siens, concentres dans cette derniere ville; non seulement il n'y a personne en Italie dont les ouvrages soient aussi celebres dans toute l'Europe que les siens, mais je ne connais pas de geometre plus spirituel et plus profond que lui. Sa mesure de la terre, son beau traite sur la loi de la pesanteur, ses decouvertes sur la lumiere et sur diverses parties de la physique, de l'astronomie, de la geometrie, son poeme sur les eclipses, imprime a Londres, a Venise et a Paris, peuvent doner une idee du nombre et de l'etendue de ses talents; mais il faut l'avoir connu particulerement, pour savoir combien il a de genie, combien son caractere est aimable, sa conversation interessante, et ses idees sublimes dans tout les genres. En 1773, il a ete appele en France et naturalise Francais. Il est actuellement  a Bassano, occupe aĂÂ faire imprimer ses nouveaux ouvrages, en cinq volumes. William Thompson-Kelvin, the English physicist (19/20 centuries), once expressed his opinion that his atomic theory is a pure "Boskovicianism." Still earlier, Sir Humphry Davy, professor of physics and chemistry at the Royal Institution in London from 1802 till 1827, mentioned the name of Boskovic on several occasions in his Diary (Commonplace Book), accepting his atomistic theory. The diary is kept in the archives of the Royal Institution in London. Also a famous Irish mathematician and physicist R.W. Hamilton wrote extensively about Boskovic's theory of forces. With his theory of forces R. Boskovic was a forerunner of modern physics for almost two centuries. It was described in his most important book Theoria Philosophiae naturalis (Vienna 1758, Venice 1763, London 1922, American edition in 1966). Among scientists from the 18th century Boskovic occupies outstanding place as a theologian, philosopher, mathematician, and astronomer. His "Theoria philosophiae naturalis" announced hypotheses which were confirmed only in the course of last fifty years.